It is with great sadness that we announce the death of our sister Maria Veronica Reina. She advocated for women with disabilities rights at international level, in particular she contributed to the Convention of the Rights of People with Disabilities (CRPD). We offer our heartfelt condolences to her family and friends. “Ms. 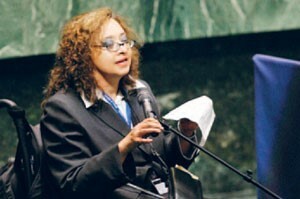 Maria Veronica Reina was Executive Director of the Global Partnership on Disability and Development at the World Bank. She participated in the drafting negotiations for the Convention on the Rights of Persons with Disabilities. Before joining the Burton Blatt Institute, Ms. Reina served as President of the Center for International Rehabilitation (CIR). In this capacity, she oversaw the CIR’s programs including Research, E-Learning and the International Disability Rights Monitor Project, a landmark international initiative that documents and assesses the situation of people with disabilities worldwide. She is a psycho-pedagogue, a specialist in learning disabilities, and a renowned international disability rights advocate. Her advocacy work has focused on raising awareness and involvement of the international community on the Comprehensive and Integral International Convention on the Protection and Promotion of the Rights and Dignity of Persons with Disabilities.” By Institute on Disability and Public Policy.